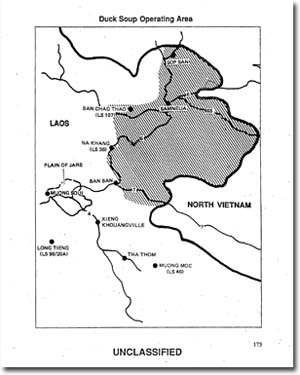 Air Force interest in nuclear options during at least two flash points in the Southeast Asian conflict: Laos in 1959 and in 1968 during the battle of Khe Sanh. CIA operational commitments for the 1961 Bay of Pigs invasion hampered the Agency's ability to carry out Kennedy administration policy in Laos. 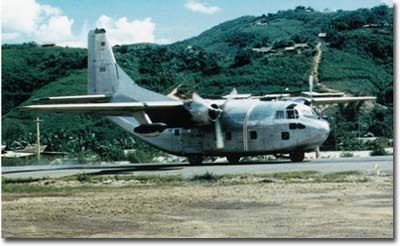 CIA proprietary Air America directed search and rescue missions in Laos in addition to its role in combat operations. The U.S. ambassador in Laos served as the field commander of the so-called "secret war" there, a role that has been largely undocumented. This briefing book was made possible through a lawsuit brought in March 2005 by the National Security Archive after it discovered through its Freedom of Information Act audits that the Air Force had a pattern and practice of mishandling FOIA requests, including failing to process requests, destroying records, discouraging requesters, and excessive delays. The Washington, D.C., law firm James & Hoffman successfully argued the case before federal Judge Rosemary Collyer, who in April 2006 granted partial summary judgment to the Archive. She found that "the Air Force has indeed failed miserably to handle Archive FOIA requests in a timely manner." The court ordered the Air Force to resolve the Archive's requests--some pending as long as 18 years--as expeditiously as possible. The requests for the Laos history and the Vietnam War studies were originally filed in 1988 and 1990; the Air Force finally processed them pursuant to the court's order and released more than 500 pages of previously-classified histories. The most recent (and recently released) document is a volume of the official history series The Air Force in Southeast Asia. Prepared by Air Force historians, Victor B. Anthony and Richard R. Sexton, the 400-page The War in Northern Laos, 1954-1973 was published by the Air Force History Office in 1993 on the basis of two separate manuscripts, one of which the Archive first requested in 1990. The Air Force initially released this history in 2006, but with much heavier excisions; as a result of a successful Freedom of Information Appeal by the National Security Archive, much more information is available. DUCK SOUP was a proposal considered during mid-1965 to use Air America to intercept North Vietnamese aircraft dropping supplies into northeastern Laos. Ambassador William Sullivan was a strong supporter, but the State Department objected because of the risk that captured Air America pilots "would confirm to the communists the [the company's] paramilitary nature." The Air Force history further reveals that, under the codename Erawan, U.S. Special Forces began to train some Laotian soldiers in unconventional warfare techniques as early as the fall of 1959. (p. 28) This predates both the CIA creation of a Hmong tribal "secret army" and the previously-known beginning of the Special Forces White Star training mission in 1960-61. As the Kennedy administration took office in January 1961, CIA paramilitary forces were fully extended in preparations for what became the Bay of Pigs invasion of Cuba three months later. The Air Force history shows that the CIA could not meet aircrew requirements for the highly classified Project Mill Pond, which President Kennedy approved in March 1961 to address the Laotian crisis. (pp. 42-43) The crews were to fly "sanitized" (unmarked) B-26 bombers on interdiction missions over Laos, and the CIA most likely was not able to supply them because its assets were fully occupied by the Cuban exile air force project that formed part of the Bay of Pigs operation. The end result was that the Air Force provided crews, disguised as civilians ("sheep dipped"), for the operation. (p. 379) Either the Air Force itself or the CIA created a phony corporation in Thailand as the ostensible employer of these airmen. The episode marked the first direct commitment of U.S. military forces to the Laotian war. The Air Force historical monographs are less ambitious than the Laos history, but they furnish a useful counterpart by providing a top-down look at a picture that the Laos history views sideways. Some of these have been previously declassified but with deletions, and they have been virtually unavailable to those interested in this era. The 1966 volume remains secret. All were part of a regular series, USAF Plans and Policies in South Vietnam, compiled on an annual basis by historians at Air Force headquarters. By focusing on the Washington command center of the U.S. military this series provides an unusual level of detail on the thinking of top military leaders, the Joint Chiefs of Staff in particular. Recent claims that the United States had won the Vietnam war by 1963 to the contrary, the volumes USAF Plans and Policies in South Vietnam 1961-1963 and USAF Plans and Policies in South Vietnam and Laos, 1964 show doubt at high levels that the U.S. was winning the war. The earlier volume discloses a brief period of optimism in the summer of 1963, but one both preceded and followed by skepticism. Air Force chief of staff General Curtis LeMay, in endorsing a February 1964 report, argued that absent considerable improvements the South Vietnamese had "at best an even chance" of survival, and in fact took this as his rationale for full-blooded U.S. intervention. (p. 7) The 1964 study is replete with similar statements that reflect pessimism about the progress of the war, not a sense of U.S. victory. In May 1964, for example, "LeMay believed that the war was being lost," or, a few months later, "counterinsurgency operations were proving ineffectual in the face of demoralized Vietnamese leadership and rising Viet Cong strength." (pp. 18, 24) These contemporaneous accounts, untrammeled by postwar debates over progress in the war, (Note 1) demonstrate the actual views of the U.S. high command. The 1967 study also provides new data on the nature of the combined military-civilian scientific analysis codenamed Sea Cabin. Long supposed to be a reflection on bombing efficiency, the Air Force history shows that Sea Cabin was intended to examine how to preserve aerial effectiveness under conditions of de-escalation. In fact the analysis, this history tells us, "was the most comprehensive examination to date of possible ways to negotiate an end to the war." The Air Force effectively scuttled Sea Cabin by claiming it reflected outdated intelligence and was inconsistent with existing Joint Chiefs of Staff pronouncements, thus in the Air Force's view requiring additional redrafting. (pp. 47-48) The 1968 volume also comments briefly on Sea Cabin. This material is an important addition to our knowledge of the Vietnam war and especially useful with respect to the air power that was so central to the United States war effort in Southeast Asia. Individually and together the monographs (Documents 2-6) were also sources for the Air Force's official histories (like Document 1) and thus help to show the kinds of raw material that contributed to those histories. This comprehensive history, similar to the published volumes of the series The United States Air Force in Southeast Asia but born classified and never released for publication, deals with all aspects of the war in Laos, although it necessarily devotes much greater detail to air than to ground operations. It contains information and analysis on tactical engagements, the political setting for various developments, the U.S. embassy's strategic direction of the war and its dealings with the Royal Laotian Government, Thailand's support for the Laotian war, Air Force-CIA relationships, and a welter of fresh information on the activities of the CIA proprietary Air America. Perhaps classified CIA histories could shed light on the internal workings of CIA programs and the operations of the Vientiane station or Long Tieng base. Document 2: USAF Plans and Policies in South Vietnam, 1961-1963, By Jacob Van Staaeveren. U.S. Air Force Historical Division Liaison Office, June 1965. Top Secret. During the early phase of the Vietnam war when the U.S. military functioned as advisers to the South Vietnamese, air operations were an important part of the U.S. role. The Air Force deployed a covert unit to South Vietnam nicknamed Farm Gate, and this unit began to fly in combat as early as 1961, in the guise of training South Vietnamese air crews. At the time the Kennedy administration considered South Vietnam a sort of military laboratory. This monograph, completed in 1965, is a source of rich detail on discussions of the tactics to be used in Vietnam, Air Force disputes with the U.S. Army over which service would field aircraft, early use of defoliant chemicals (including what became known as "Agent Orange"), and the general attitude of the Air Force toward the war in Southeast Asia. This monograph series is to be distinguished from the history released above in that it represents a more contemporaneous account compiled by service historians based almost entirely on internal documents. It is not as polished a product, but presents opinions not clouded by later historical debates. This and the following documents are called "monographs" because they are typescript and double-spaced rather than typeset, as is the Laos history. Document 3: USAF Plans and Policies in South Vietnam and Laos, 1964. U.S. Air Force Historical Division Liaison Office. (Date and author not given), Top Secret. Actually the fourth in the series of Air Force monographs (the two intervening studies remain classified), the 1964 volume concerns a year of key transitions in the American war, when the U.S. role shifted increasingly from advisory efforts to unilateral military operations. This is the year of Tonkin Gulf and Yankee Team and other covert pressures against North Vietnam. Because much of the military planning concerned the preparation of plans to bomb North Vietnam, the monograph is especially strong on the development of the Joint Chiefs of Staff target list and the Washington debates over possible responses to various incidents that took place in South Vietnam. As noted previously, Air Force pessimism regarding the situation in Vietnam was marked. The monograph, like others in this series, presents data on South Vietnamese air operations that is not available elsewhere. Document 4: USAF Plans and Operations in Southeast Asia, 1965, by Jacob Van Staaveren, U.S. Air Force Historical Division Liaison Office, October 1966. Top Secret. Prepared in 1966, this monograph ranges over the year the Johnson administration began its Rolling Thunder aerial campaign over North Vietnam and began to fight a ground war in the South. The Air Force's institutional interest in grabbing the largest share of the combat action, in this observer's view, was responsible for its opposition to the large ground force commitments that President Johnson decided upon, and which are the focus for much of the discussion in this account. The monograph provides considerable detail on the deployment of Air Force units to Southeast Asia and its operational difficulties in mounting Rolling Thunder. In keeping with the goal of this series simply to furnish a sort of reference point for Air Staff to consult in the course of their planning and deliberations, the paper draws few conclusions. It seems clear from the context that the Air Force considered victory possible through its air campaign. Document 5: The Air Force in Vietnam: The Search for Military Alternatives, 1967, by Jacob Van Staaveren, Office of Air Force History, December 1969. Top Secret . Prepared in 1969, when the Rolling Thunder campaign had been terminated and the Nixon administration had begun to reduce the level of its air operations in Southeast Asia, this monograph begins to take a more explanatory approach. One example is the point made above regarding growing doubts, including suspicions of the military's own data, about how the Air Force could judge success in the war. Numbers of sorties flown and tonnages of bombs dropped were deemed inadequate, and estimates of those "killed by air" were increasingly recognized as tenuous. The Air Force created both military and civilian panels in an attempt to derive a more satisfactory measure of merit. The main focus of the monograph is on the several successive efforts during 1967 to craft a deployment program and military strategy for Vietnam, and the evolution of Air Force arguments in that inner debate. The details of the then still ongoing Rolling Thunder operation are not neglected but the focus remains at the higher level. It is noteworthy that the huge public debate over the efficacy of the air war, which featured in major congressional hearings in the summer of 1967, is barely reflected in the monograph. 1. The victory view has most recently been advanced by scholar Mark Moyar in Triumph Forsaken: The Vietnam War, 1954-1965 (New York: Oxford University Press, 2007). 2. As in H. R. McMaster, Dereliction of Duty: Lyndon Johnson, Robert McNamara, the Joint Chiefs of Staff and the Lies that Led to Vietnam (New York: HarperCollins, 1997).